Nothing screams AC/DC enough like “Thunderstruck” does. Behind for over a decade, the band saw their unlikely comeback with the track. Surprisingly enough, this isn’t the first comeback AC/DC has ever done. The band came back with “Back in Black” in 1980, making us think AC/DC’s been playing us for fools. They sure knew how to keep the fans interested enough yet without the impatience of leaving them. Released in 1990 in the album The Razor’s Edge, “Thunderstruck” rose to the occasion by starting the album loud and crazy. A brooding ensemble takes shape as Angus Young’s systematic yet menacing arpeggio courses through the amps. This brooding energy is augmented by the incoherent but haunting chants of the band members. “Thunder!” This time the audience joins the chorus. “Thunder!” The atmosphere electrifies. “Thunder!” The drums summoning the rolling rumble. “Thunder!” The final utterance, signaling the chaos about to ensue. Brian Johnson’s screech pierces through the unison of voices, heralding the beginning of a tempestuous affair. He follows Angus Young’s cadence, with the iconic riff in the background. The simple yet driving progression of Malcolm Young’s guitar is perfectly held together by Cliff William’s bass. Chris Slade’s drums provide the tempo and hard-hitting action of the track. “Thunderstruck” was the perfect starter for The Razor’s Edge with its polarizing appeal. They did well with adhering to the band’s theme with this one. The music video was ahead of its time as well. The ingenious cameras on the drumsticks and guitars showed the audience a whole new perspective in playing instruments by the hands of legends. The iconic Angus Young duck-strut was shot from below a Plexiglass platform, a creative transition for the music video. The whole audience-on-racks ensemble oozed a dystopic atmosphere, and certainly improved the whole experience with the crowd in full hype. It was all worth it in the end, when the band received $500,000 USD for licensing the song to the movie Varsity Blues, making it one of the most expensive songs in the history of rock. The lyrical entropy, laden with subtle sexual innuendos, completed the recipe for AC/DC. 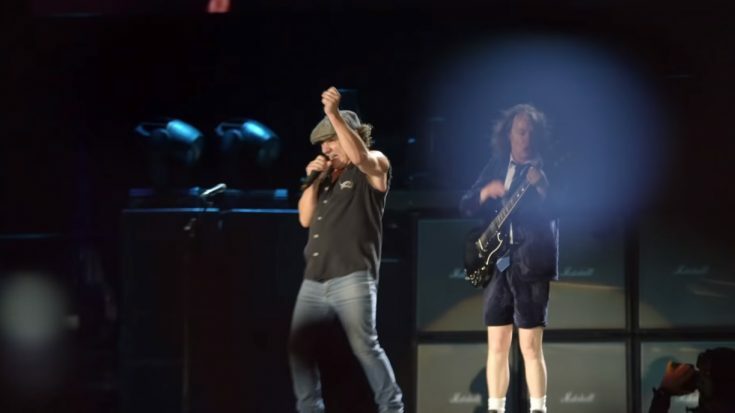 While people may say the band stuck on the same formula for years, over and over, AC/DC still miraculously manages to make it work. The explosiveness of “Thunderstruck” was the secret ingredient for reviving the band’s legacy, with a shocking jolt of the AC/DC trademark. In our books, this is what timeless masterpieces destined for greatness, are made of.